On April 10, the San Diego City Council heard the issue of whether to certify the Pure Water Environmental Impact Report (EIR). The City Public Utilities department presented the project and explained that if the EIR was not certified as presented; the process would be delayed by 18 months, also the city risked state grants and might not be eligible for federal low interest loans. The Metro Biosolids center was built in 1998 and the Utility Department offered no explanation as to why they waited until 2016 to investigate pipeline options. Community members and organizations from University City, Clairemont, and Scripps Ranch made public comment in opposition to portions of the project. UCCA, UCCF, and UCPG were all represented by speakers opposing the Morena pipeline alignment. Councilmember Bry (University City) proposed amendments to address some of her constituents concerns, as did Councilmember Kersey (Scripps Ranch). The measure passed, unanimously, to certify the EIR. 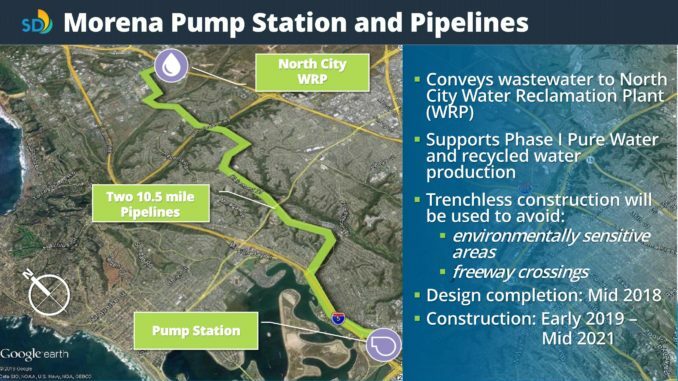 The schedule calls for construction to start on the Morena Pump Station and the North City site first, followed by the pressurized pipeline between the Morena Pump Station and the North City Water Reclamation plant. Construction on the Morena forcemain will start in early 2019 and last through 2020. The forcemain, and its return brine concentrate line, will run through University City along Genesee to Nobel, then Nobel to Towne Centre, up to Executive, before tunneling under 805 to the North City site. Most of the construction is open trench, requiring lane closures at night, along Genesee. The trench will be approximately 15’ wide to accommodate the 48” pressurized sewage line and 30” pressurized return sludge line. When work is not happening the trench will be covered with steel trench plates. There will be a staging area for equipment and removed materials in the Marian Bear parking lot at Genesee. This will limit access to the parking lot except on weekends. Construction along Genesee will occur at night, after 7:00pm, and during the day at Nobel and Towne Centre Drive. There will be trenchless construction (tunnels bored) under San Clemente Creek and the ramps south of 52 as well as under Rose Creek and the Amtrak rail lines. A working group will be formed with community members, the city utility department, and the contractors to address community construction concerns. It is important we hold the city to the promises made at the hearing including verification and removal of contaminated soil from Genesee and Governor in a legal and responsible manner. This sewage forcemain, if it proceeds as planned, will be constructed directly adjacent to the following residents, businesses, and synagogue in University City and UTC: The Villas at University Park; Regency Villas Condominiums; the west side of Tamilynn Street; the Park Condos; University Square shopping center; east end of Millikin Ave; east side of Fisk Ave; La Jolla Park East; La Jolla Park West; The west side of Calgary Street, Pacific Gardens Apartments; La Jolla Nobel Apartments; Cambridge Terrace; University Towne Square; Costa Verde shopping center; Westfield UTC Mall; Torrey Pines Village; Vista La Jolla; Westwood Apartment Homes; Renaissance La Jolla; Renaissance Towne Centre; Congregation Beth Israel; La Jolla Gateway; Embassy Suites Hotel; One La Jolla Center; Devonshire Woods; Alexandria Technology Center; and La Jolla Commons.